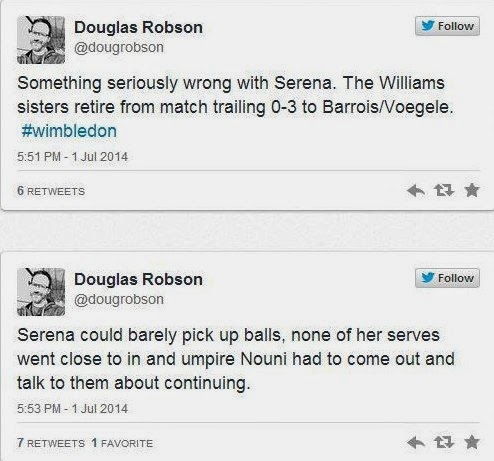 WIMBLEDON, England -- In a bizarre scene at Wimbledon, Serena Williams appeared disoriented in a first-round doubles match with sister Venus and was forced to retire after three games Tuesday. No. 1 Serena, who lost in the third round on Saturday to Alize Cornet of France, looked unsteady in the warm-up against opponents Kristina Barrois and Stefanie Voegle. 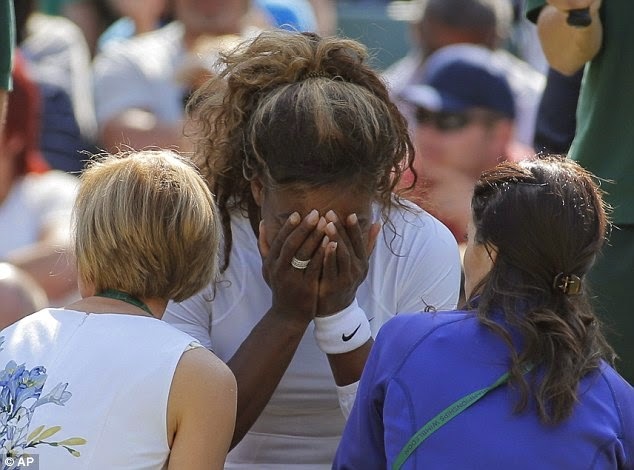 A doctor was called on court, and Serena appeared to be in tears as she sat in the changeover chair. 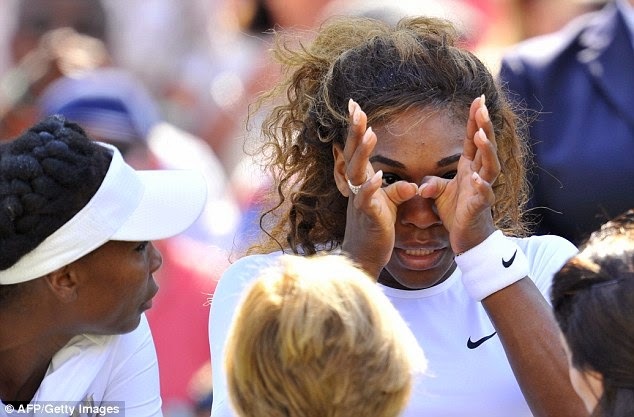 She buried her hands in her face and consulted with the doctor for 10 minutes before taking the court to play. "I am heartbroken I'm not able to continue in the tournament. I thought I could rally this morning, because I really wanted to compete, but this bug just got the best of me. I want to thank my sister, Kristina, Stefanie and our teams for their support. We were all looking forward to a great match. From the bottom of my heart, I thank all of the fans for their cheers and understanding. I look forward to returning to Wimbledon next year." Serving in the third game, Serena could at times barely grip or catch the tennis ball. All four of her serves were double faults. None even registered on the radar gun. After a visit from the umpire, Kader Nouni, and consulting with Venus, the eighth-seeded sisters retired trailing 0-3. "Strangest 15 minutes I've seen on a tennis court, without a doubt," two-time U.S. Open champion Tracy Austin said on BBC TV. Later, Serena's half sister, Isha Price, said her 32-year-old sister had been "sad" and "emotional" since her loss three days ago to Cornet and hadn't been eating much, but not more than normal after a tough loss. Sasha Bajin, Serena's longtime hitting partner, declined to comment. Price said Serena did not appear ill before the match, and she wasn't aware of any medication she might be taking. Price said the five-time Wimbledon winner would not have taken the court if she were not well. "She seemed emotional, sad, you know what I mean?" said Price, who declined to speculate on whether Serena's state of mind had anything to do with her coach, Patrick Mouratoglou, who said in a text message he had not seen Serena in two days. "Unfortunately Serena has been feeling unwell for the past few days and she just couldn't play to her potential today. I'm really proud of her for trying because we just love playing doubles together. We are looking forward to coming back to Wimbledon next year." ESPN analyst Pam Shriver, who was on the court, said it was one of the stranger things she had seen. "You can have reasons not to feel right on the court but nothing that would make you not be able to hold the ball in your hand or catch the ball after a bounce or throw the ball up," Shriver said. "You might hit four double faults in a row but you'd make contact." Like many, Shriver said she wondered: "Is this a drama? Is this an act? If you're not well, you need to get help." Price said Serena was seeing a doctor to find out what is wrong.